The eighth entry in the Walt Disney Signature Collection is The Little Mermaid, which splashes onto Blu-Ray and 4K on February 26th. But fans who’ve already moved away from physical media can now add one of the greatest animated films of all time to their Movies Anywhere library with today’s digital release. With new bonus features, including a digital exclusive, it’s an easy sell for anyone who already owns the previous Diamond Edition. 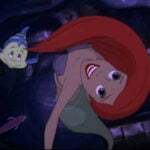 Ariel is a mermaid who dreams of life out of the sea. After falling in love with a human, she makes a deal with Ursula the sea witch to trade her beautiful voice for human legs. But once out of the water, she discovers that she’s now a pawn in a bigger scheme to steal her father’s crown. 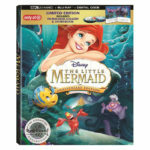 If any post-Walt animated film belongs in the Walt Disney Signature Collection, it’s The Little Mermaid. 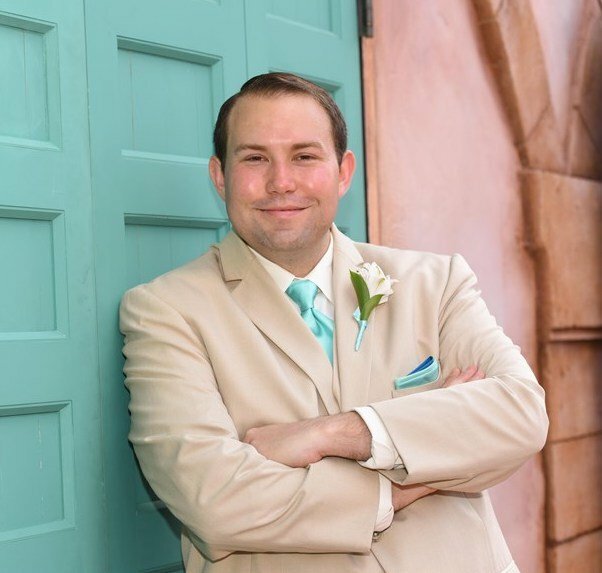 It single handedly reinvigorated the animated medium, opening the door for the Disney Decade and all the great films that came in its wake, including Beauty and the Beast, Aladdin, and The Lion King. In addition, Walt Disney personally tried to develop the Hans Christian Andersen story. The Academy Award winning music by Alan Menken and Howard Ashman also reinvigorated interest in Disney music and brought back the animated musical. “Part of Your World” is the ultimate “I Want” song, “Under the Sea” is insatiably catchy, “Poor Unfortunate Souls” ensured that Disney Villains would get their own song for decades to come, and “Kiss the Girl” is unforgettable. 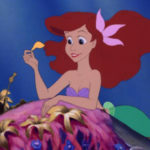 While Alan Menken would later produce music that is more acclaimed or revered, the score from The Little Mermaid is still among the finest ever written. 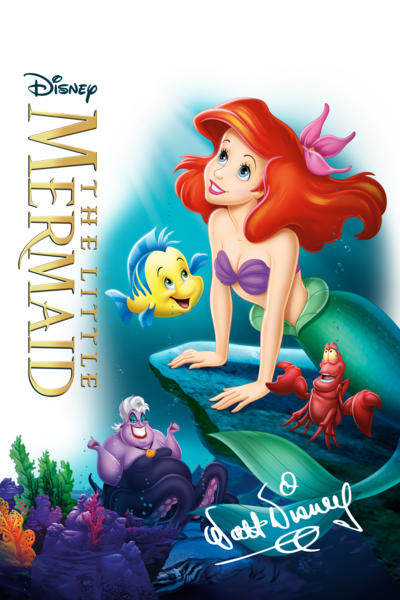 Celebrating its 30th anniversary this year, the Walt Disney Signature Collection release of The Little Mermaid adds new retrospective bonus features to over three hours of previously released content, all of which is included with this digital release. Sing-Along (1:22:18) – Watch the film with stylized lyrics that light up, the same ones seen in the theatrical “Second Screen” experience from 2013. This is the first time they’ve been made available on home video. Audio Commentary (1:22:18) – Ron Clements, John Musker, and Alan Menken lead an insightful discussion of the film and reveal many behind-the-scenes secrets, including some hidden easter eggs. Digital Exclusive – “Part of Your World”: A Look Back (5:50) – Jodi Benson and Alan Menken sit together at a piano to discuss Ariel’s memorable balad and perform it together. Alan Menken and the Leading Ladies (15:45) – Alan Menken (Composer), Jodi Benson (Ariel), Paige O’Hara (Belle – Beauty and the Beast), Judy Kuhn (Pocahontas), Lilliias White (Calliope the Muse – Hercules), and Donna Murphy (Mother Gothel – Rapunzel) sit around a piano to sing and discuss their contributions to Disney Animation. It’s 15-minutes of pure joy and Alan Menken’s glee is infectious. “What I Want From You Is… Your Voice” (5:47) – Actors from the film record their dialogue in some rarely seen VHS footage that includes Jodi Benson, Buddy Hackett, Pat Carroll, and Samuel E. Wright. Stories from Walt’s Office: Gadgets & Gizmos (6:01) – Walt Disney’s personal collection of miniatures are highlighted by archivists Becky Cline and Ed Ovalle in a tour of his restored office at the Walt Disney Studios, including a miniature of the statue of the Little Mermaid that was gifted to him at Tivoli Gardens. #TreasuresUntold (5:40) – Ruby Rose Turner and Olivia Sanabi from Disney Channel’s Coop & Cami Ask the World reveal some fun facts about The Little Mermaid. Digital Exclusive – Visual Development Galleries – Backgrounds, Visual Development, and Character Model Sheets galleries give fans a peak inside the Animation Research Library. DCapella “Part of Your World” Music Video (3:01) – Disney’s a capella group performs the iconic song from an aquarium. Song Selection – Jump directly to seven songs from the film. “Part of Your World” by Carly Rae Jepsen (3:39) – The “Call Me Maybe” singer performs Ariel’s ballad while shopping in a city where her reflection has a mind of its own. “Kiss the Girl” by Ashley Tisdale (3:25) – the High School Musical star pops up Sebastian’s love song at a high school dance with an undersea theme. Under the Scene: The Art of Live-Action Reference (13:13) – John Musker, Ron Clements, Katherine Beaumont, Josh Finkel, and Sherri Lynn Stoner talk about the history of live-action reference footage and how it was revived for The Little Mermaid. Howard’s Lecture (16:27) – Excerpts from one of Howard Ashman’s lectures to the animator’s is presented with an discussion by Jodi Benson, Ron Clements, and John Musker. Storm Warning: The Little Mermaid Special Effects Unit (8:43) – Effects animators talk about the special effects in the film and look back on the techniques used. The Little Mermaid: The Story Behind the Story (11:32) – The original fairytale by Hans Christian Andersen and the author himself are explored in this featurette. “Under the Sea” Early Presentation Reel (2:38) – This proof of concept was used to sell the film to Disney, including a demo track by howard Ashman and concept art that doesn’t match the final film. Deleted Character: Harold the Merman (2:05) – John Musker and Ron Clements introduce a storyboard sequence with a character named Harold, a merman who is tricked by Ursula. Treasures Untold: The Making of The Little Mermaid (45:33) – A 5-part making-of documentary that sums up the entire experience of making the film, including the fact that the film was produced in a parking lot in Glendale and the pressure of making it work to save Disney Animation. Deleted Scenes with Introductions – Seven deleted or alternate scenes are presented in storyboard form. DisneyPedia: Life Under the Sea (8:28) – An educational featurette that showcases the real world sea creatures that inspired the characters in the film. @DisneyAnimation (10:49) – Animators and creative talent at Walt Disney Animation Studios discuss how The Little Mermaid inspired them to do what they’re doing today, along with a look at the animators from the film that were still with the company when this feature was produced in 2013. Part of Her World: Jodi Benson’s Voyage to New Fantasyland (4:51) – The voice of Ariel takes a trip to Walt Disney World to experience “Under the Sea – Journey of the Little Mermaid” and the Little Mermaid inspired section of Disney’s Art of Animation Resort. Original Theatrical Trailer (2:18) – See how Disney promoted the film on its original 1989 theatrical release. Ride with Disney Imagineers (4:19) – The same digital ride with commentary from the creators. Behind “The Ride That Almost Was” (5:57) – Imagineers discuss why The Little Mermaid would lend itself to an attraction and why they spent years developing an attraction based on it. In terms of quality, the film looks great. While grain has been eradicated from nearly every shot, there is no evidence of DNR washing away details. Colors also feel accurate, with softer, subtler tones that don’t feel ramped up in an effort to make the film look more modern. In other words, it’s about as faithful as an animation restoration can be while still offering a modern HD presentation. The digital release through iTunes presents the film with a 5.1 Dolby Digital mix. Compared to the Diamond Edition 7.1 mix, it sounds a lot more compressed. However, the score and sound effects travel around the room, creating an immersive experience that at least sounds better than the DVD release. However, these compressed tracks are one area where digital releases need a lot of improvement to match Blu-Ray quality. The Little Mermaid is one of my favorite films and the first one I remember seeing in a theater as a kid. Any excuse to revisit it is always a treat and this Walt Disney Signature Collection anniversary edition adds a few insightful and nostalgic bonus features to a collection of worthwhile behind-the-scenes content. The digital edition is available now, with Blu-Ray and 4K coming on February 26th.